Steve Jobs' official biographer, Walter Isaacson, tells it how it is. We've been looking at some leadership lessons to learn from Apple's (Nasdaq: AAPL) Steve Jobs, brought you directly from Walter Isaacson, Jobs' official biographer. Isaacson recently wrote an article for Harvard Business Review with his take on how business leaders can learn from Jobs. Don't forget to check out the first seven lessons if you haven't already done so. Without further ado, here are seven more. This was a lesson that Jobs learned from one of his early mentors, Mike Markkula. Jobs told Isaacson, "Mike taught me that people do judge a book by its cover." Apple goes to great lengths to focus on presentation and packaging more than most companies do. The company even has packaging designers whose sole position is to design the unboxing experience. Adam Lashinsky's recent book, Inside Apple, offers additional insight. He writes of how Apple has a secure room for a packaging designer that's filled with hundreds of box prototypes while the designer spends all day just opening the boxes and designing every minor detail to "[evoke] the emotional response Apple was looking for upon opening up a product for the first time." Apple views the unboxing as the culmination of all the hard work and effort that the company puts in, leading up to that final moment when a customer takes home an Apple product. It's no secret that Jobs was a perfectionist, and that never stopped him from backtracking if he felt it was necessary. Even if a product design was marching along swimmingly, he wouldn't hesitate to have Apple's design team redo the whole thing and start from scratch if need be. Jobs even wanted parts that few mortals would ever see to be perfect -- a lesson he learned from his mechanic father when building a fence. Even though Jobs went to great lengths to make the guts of Apple's products as inaccessible as possible to regular users, he still made sure the innards were designed to perfection. Jobs' merciless ways can also be tied to an intolerance of subpar employees. He felt that many managers and executives are too coy to be honest with unexceptional workers that it can become a drag on the company. Jobs believed it was his "job to be honest," and that included tearing down an employee who didn't do something well enough. His callous tactics work only in conjunction with his ability to inspire loyalty, though, which is a tough balancing act for any leaders looking to mimic his style. Jobs was a big proponent of random face-to-face encounters, even though technology inadvertently discourages that type of meeting through digital communication mediums such as email and messaging. "Creativity comes from spontaneous meetings, from random discussions," he believed. This is also why he structured Pixar's headquarters around a central atrium -- to promote chance encounters with colleagues in different departments. Pixar's John Lasseter, director of many of the studio's earlier hits, including Toy Story and A Bug's Life, said: "Steve's theory worked from day one. I kept running into people I hadn't seen for months. I've never seen a building that promoted collaboration and creativity as well as this one." Related to the focus on end-to-end responsibility, Jobs fretted over minute details as much as he did broad strategy. Most CEOs don't focus on the types of things that Jobs would, such as how many steps it takes to get to various sections of Apple stores, or the specific color hue of a product. Simultaneously, he would be concocting high-level strategies such as the "digital hub" idea in 2000, where the Mac would be the center of a user's digital life, and how he moved that "hub" into the cloud in 2010. Isaacson frequently portrayed Jobs at the intersection of art and technology. 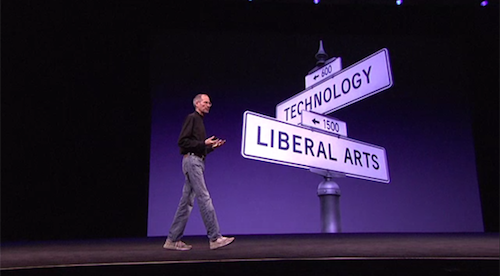 Even Jobs himself used a similar slide during many of his keynote presentations. This idea became a lifelong theme for Jobs and helped drive his artistic approach to creating technology products. Isaacson notes that there were better technologists, including Apple co-founder Steve Wozniak or Microsoft's (Nasdaq: MSFT) Bill Gates, and similarly greater artists were out there. But Jobs was able to link them together in a profound way with game-changing results. For obvious reasons, this last one resounds with us Fools. Jobs' personality was shaped by two major cultural movements: the hippie counterculture and the rise of Silicon Valley. He merged these ideas by always heeding his hippie roots while pursuing his business ambitions. Apple's famous "1984" ad balked at conformity while marketing the Mac. Ironically, Apple's focused product line can even inspire a sense of conformity nowadays, as any coffee-shop frequenter will now notice a good chunk of patrons sitting in front of MacBooks that all look alike. I, for one, fully intend on staying Foolish. Apple has helped usher in the mobile revolution, but it's hardly the only winner. A handful of critical component suppliers are set to cash in from behind the scenes. If you're looking for 3 Hidden Winners of the iPhone, iPad, and Android Revolution, then you're in luck. Get this new special free report now while you still can.